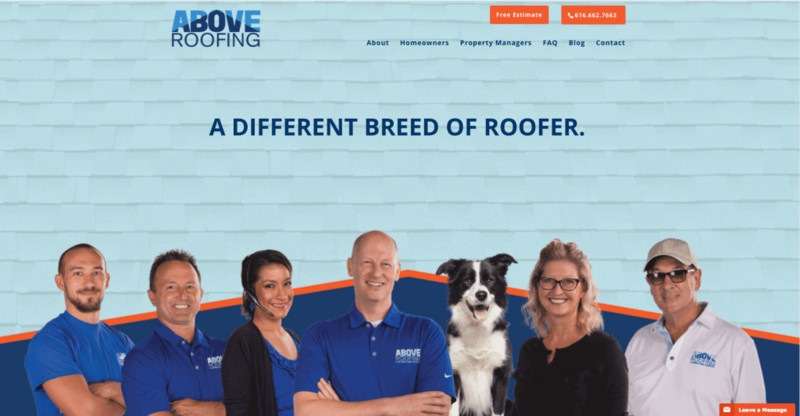 Above Roofing protects its customers, so it’s only natural that they would turn to a bank that looks out for them when they wanted a construction loan. What kind of business compares itself to dogs? One with good humor and the desire to protect their customers – just like a loyal canine. Robert’s motivation for starting Above Roofing in 1996 is the same force that drives the business today. Protection is the driving force behind every job and everyone on the job. Robert’s team of 30 includes 18 permanent employees and 12 subcontractors. He doesn’t take just anyone who strays in. They do full background checks, and all new hires are held to a high standard of caring. “Will this person protect our customers? Will they take care?” Robert uses this measure in both hiring and performance reviews. “It’s about doing the right thing—treating people right, and protecting them,” he said. Doing the right thing also builds a great reputation for the company. Customers love them and refer them often. The Better Business Bureau recognized Above Roofing with their Integrity Award. And in the industry, Robert’s team earned a Top 50 Remodeler Award from Remodeler Magazine. “We’re a different breed of roofer. We care and we try to do things better. We’re not the least expensive, but we want to be a good value – provide quality and a good price. This is part of how we protect our customers. “We earn trust through skill and integrity,” Robert said. “I grew up with a single mom – that’s where my ‘why’ [for doing this business] comes from,” Robert said. “I always wanted to protect her.” He now directs his protection toward his customers. Robert takes great pride in communicating with integrity. When you treat people right and deliver value, your business grows. For Above Roofing, this evolved into cramped quarters. “We ran out of office space! It’s awkward when you’re interviewing someone and you don’t have an office for it,” Robert said. So, they made plans for a new building with a 7,000-square-foot warehouse and 2,000 square feet of office space. When it came time to get a construction loan, Robert shopped around and one financial institution stood out from the rest. Plus, Robert knew Consumers cared about him and his business. “I really enjoy working with Robert and Pamela, who have the utmost integrity,” said Jeremy. “It’s pretty obvious as to why they have been so successful: They treat their customers, employees and vendors with great respect. Robert knows that no matter how great your business is, you need a healthy labor market. “In this industry we have a hard time finding qualified people to work. There’s simply a lack of people entering the construction trade,” he said. That’s why Above Roofing is partnering with Grand Rapids Community College to offer their instructors a day of training. Again, it’s a way to protect the industry and the community by making sure qualified roofers are available to meet demand. We’re proud of the work Above Roofing is doing with their customers and for the next generation of roofers. Thanks for choosing us for your construction loan, Robert – we’ll protect you like you protect your customers!